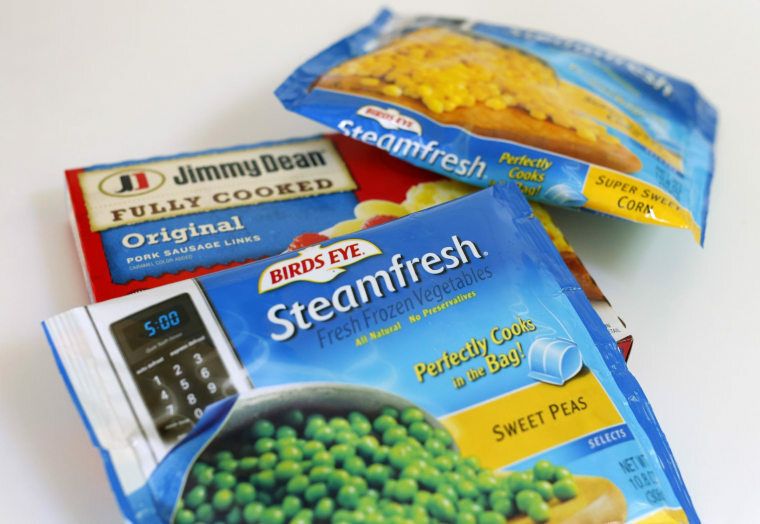 Hillshire Brands is pushing further outside the deli case with a deal to buy the maker of Birds Eye frozen vegetables, Duncan Hines cake mixes and Hungry-Man frozen dinners. The Chicago-based company, which makes Hillshire Farm lunch meats, Jimmy Dean sausages and Ball Park franks, said Monday that it would buy Pinnacle Foods in a deal valued at $4.23 billion. The move extends Hillshire's reach into other sections of the supermarket as more Americans watch how much meat they're eating. Among Pinnacle's other brands are Wish-Bone salad dressing, Celeste frozen pizzas and Vlasic pickles. "Meats go with vegetables, sandwiches go with pickles," Hillshire CEO Sean Connolly said in explaining why the deal made sense during a conference call with analysts. In a phone interview, Connolly noted that Americans are eating meat just as often, but less of it per meal. He said that actually benefits Hillshire because food products that incorporate different ingredients — such as its Jimmy Dean breakfast sandwiches — are more profitable than simpler items like lunchmeats or sausages. "We've often said we like products that are more than just meat," Connolly said. Last month, Hillshire also said it was buying Van's Natural Foods, which makes gluten-free products including cereal, chips and snack bars. Given its reduced reliance on meat, the new Hillshire is expected to have significantly higher profit margins. Rising prices for fresh meat have hurt margins and led the company to increase prices in stores. Still, some of Pinnacle's brands such as Hungry-Man are seen as having an outdated image at a time when many people are trying to move away from foods they feel are processed or unhealthy. On Tuesday, the frozen food industry even plans to launch its first TV ad defending the nutritional benefits of its products. When asked whether Hillshire plans to hold onto all of Pinnacle's products, Connolly said it was "too early to tell," but noted Hillshire's record of focusing on its strongest brands. He added that Birds Eye, which has a more health-conscious image, was particularly attractive to Hillshire when evaluating the deal.